In Part 1 of this series on the psychology of Diablo III loot I talked about how the anchoring effect can affect our estimates of value for auction house items. In Part 2, I described how the availability heuristic can trick us into thinking that epic item drops are more common than they are. In this part, let’s look at the interaction between the auction houses and loot drops, including a suggestion on how to reclaim some of the fun of the loot drop. Instead of Tristram, let’s head to Sweden to begin. Wolfram Schultz was working there as a neuropsychologist studying Parkinson’s disease in lab monkeys when he almost accidentally started a line of research that ultimately suggests a way that Blizzard could encourage us to keep grinding for new loot. Schultz’s research involved dopamine and dopamine receptors in the brain. Dopamine is a chemical that’s released when we encounter something pleasurable, like a piece of fruit or a Legendary Mighty Weapon for our Barbarian. The chemical is hugely important for learned behavior and motivation to persist in a task, since when it’s released certain brain cells go bananas and make us feel good. Maybe even euphoric. What this means is that dopamine receptors are part of a system that’s about pattern recognition and figuring out how to get more good things out of life. Schultz and his colleagues discovered that presenting a lab monkey with a bit of fruit caused the creature’s dopamine neurons to light up. They also discovered that when they repeatedly preceded the treat with a light or a sound, the neurons would start to fire when the monkey saw the light or heard the sound, but then remain relatively inactive when the fruit showed up. The system they had discovered was, at its core, about anticipation and trying to predict rewards based on what was happening in the environment. Loot drops were indisputably core to the Diablo and Diablo II experience for all these reasons. Hearing the little “ting!” sound and seeing the beautiful, colored text indicating that a unique item had dropped produced a rush that every player looked forward to. Only, not so much with Diablo III. I suspect that the execs from Blizzard are too busy cackling and having money fights with the cuts that the company takes from real money auction house transactions to care, but this seems like a huge part of the game’s core appeal is now lost. I think there’s some middle ground, though, which is why I think the game should have a class of super items that are bind on equip. In MMO parlance, “bind on pickup” or “BoP” items are treasures that bind to your character’s account once they’re equipped. This means they can’t be given away, sold, or otherwise transferred. You can just equip them, break them down for crafting materials, or just sit there and stare at them in your inventory. Finding a really good, color-coded item that’s BoP would restore some of that “ting!” feeling and dopamine rush, because it will be something that you won’t be able find on the auction house. Making the best items in the game BoP would go a long way towards creating those familiar dopamine rushes because they would signal a clear and strong reward, but even making them run the full range of quality would probably still work, since seeing one drop would signal the tantalizing possibility of something otherwise unobtainable. Suddenly, the loot drop would be back, baby. 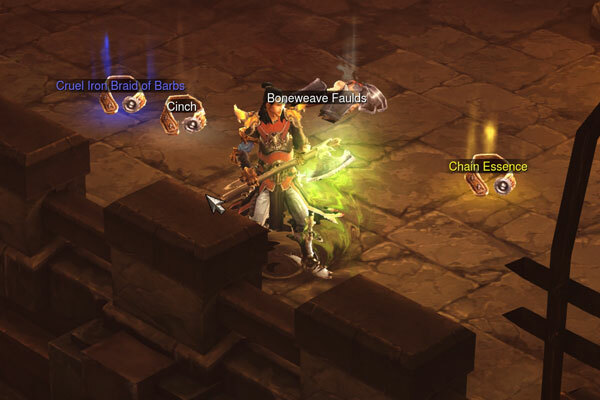 So there you have it: three suggestions for tweaking Diablo III loot based on psychology. If you’re a game designer I’d love to hear your thoughts on these, especially if you’ve experimented with anything similar. Done? You can go back to go back to Part 1 about anchoring in the auction house, or back to Part 2 about the availability heuristic. Finally, there’s a bonus part 4 about the effect of item history on auction house prices. 1. Yes, high quality items still mean big returns on the auction house, but the whole process of listing, selling, and transferring the money is too far removed to elicit the same dopamine rush. It is more interesting economics than psychology to discuss the implications if a 1/500 drop item is worth 1000+ times the average and the “1%ers” drive the market. Even if the economic value is positive, my guess is there is not a lot of casual fun or dopamine for payoffs that are in the once or twice a month range. Expanding upon my previous comment: people play negative-sum slot machines in a casino to enjoy the thrill of winning. People also but one in 60 million lottery tickets. But since even they have to understand that after a lifetime of lottery tickets, they will probably never even have a friend of a friend who won. Yet they buy lottery tickets. Can someone who grinds 100 hours for a chance at a great weapon, or buys a lottery ticket, be explained by dopamine? Is there an anticipating-future-dopamine high? The number of people who use and ignore the AHs seems to be all over the place. I’ve talked to veteran gamers who haven’t bothered, and I’ve heard from people who never played a Diablo game before who went straight for it. My monk has now 100h+ played. i’ve been farming inferno for some time now and haven’t found any upgrade yet. With my dropluck I’m pretty much forced to use the AH since gear is progress in D3. On the other hand a friend of mine was on his first Inferno farming run and found a 800dps fist weapon that was a huge upgrade for me. It’s just not as rewarding to grind to slowly see your gold rising until you can afford an item. And then repeat. I think that’s pretty much the same as in WoW when the started to introduce all the different points. It’s suddenly no more the dopamine rush every time I killed when killing Illidan for the offhand. Suddenly it was a boring grind and the only skill was maximizing your points gained per week. And the same thing is true for D3. What I do and what the designers thought people will do, playing acts over and over again to get loot is suddenly the most unefficient form to progress. We all should just grind for gold to get our items from the AH. And that’s boring as hell. What I really would like to see is that you can extract certain (random) attributes from items and if you use those “essences” will put that attribute on that item. The more essences you use for crafting the higher is the chance, that you get a really high value for that stat. One thing I really miss from Diablo 2 is the gem-drop ‘ting!’ noise. Gems drop soundlessly now, and the ‘ting!’ is reserved for the sort of gear I’m just going to vendor anyway. D3 just doesn’t stimulate the loot senses. you have to use the AH because it’s in blizzard’s interest for you to do so. the drop rates are purposefully too difficulty to effectively itemize your character without it. the entire game was designed to feed the AH with hopes that people will use the RMAH because blizz can make more money from it. i have a bigger problem with 4 difficulty levels making up for a lack of content. why not make more content with 3 well refined difficulties? it’s an entirely different game once you get to inferno and the presentation to the user is poor at best. the only drops you hear in this game are $. pаragraph here at my house. I think you make some very good points in you’re articles. I personally stopped playing Diablo 3 because I did not get the sense of progress or satisfaction anymore. And to break that down, i think games (especially games like Diablo or MMO’s) need to make players wonder “What’s coming next”. The not knowing what’s next and what you might discover or find (with loot drops i.e.) is something that keeps players motivated and eager to play on. I personally think that Diablo III has to much transparency, the Auction House is something that greatly contributes to that transparency. This means players are more aware of the things going on ‘under the hood’ rather than feeling a sense of immersion in the game world. When you discover the boundaries and the mechanics of a game as a player, you are no longer immersed as much, and with people constantly thinking about the AH and grinding Acts over and over again, they are constantly occupied with the ‘Meta Game’. Wich means they feel less connected with their character and the world that the character is in. And this results I think in the fact that you get less involved and therefore less satisfaction with progress or good loot drops. I admit i love video games and I know im addicted and from what i am reading from all the comments i think its time for me to withdraw from all the games. I feel bad my son mite miss out on the real world since he is starting to love video games at such an early age. Thank you for giving me some insightful ideas. My usual fallback for so many great ideas has a good one here too, that I’ve never seen in any major current title – Nethack’s named items. Nearly all of the loot drops are random (but plentiful) in NH, and one who hasn’t played much or hasn’t done much research would probably just go through the game with whatever was dropped, which would be fine. However, if you go to the trouble of sacrificing mob corpses on co-aligned altars, you can get your god to give you a named weapon with much more power. I think this would be a lot less compelling in a multiplayer game (although from the story perspective it could add a lot), but in a single-player game this kind of thing could add a lot of dimension, especially if the concept was carried through more than just a single item.